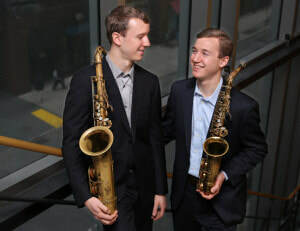 Multi woodwind players, THE ANDERSON BROTHERS have defined the future direction of jazz within the millennial generation and I'm happy to announce that Standards and The Great American Songbook are alive and well in the hands of these twin brothers. Playing to sold out audiences wherever they go these young masters are carrying the torch for the music we all love. Personality through and through has defined their musicianship and their ability to instantly connect with their audiences well beyond their years. Nothing new here folks. Hard work and going right to the source has given them the knowledge, expertise, and experience to attract jazz audiences everywhere. Come hear for yourself.